Rose and her brothers mock the crazy old Birdman, who sits in his wheelchair surrounded by ugly gray pigeons. The birdman thinks his pigeons are beautiful, but the only things Rose thinks are beautiful are gardens full of red and yellow and blue flowers. 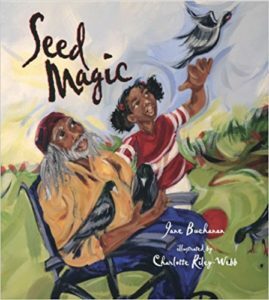 The Birdman fills Rose’s hand with seeds and tells her they are magic if she plants them outside her window they will grow a garden. Her brothers don’t believe, but Rose sets the seeds out and waits. Soon, just as the Birdman promised, a garden appears before her eyes a musical flurry of blue and red and yellow birds, drawn to Rose’s window by seed magic.